Hosted by Congressman Russ Carnahan, and co-hosted by the Office of Senator John Kerry and the Office of Senator Barbara Boxer, the U.S. Institute of Peace, Fork Films, the Institute for Inclusive Security, and Vital Voices, are pleased to collaborate on the pre-screening and panel discussion of the new film, “Peace Unveiled.” A discussion will follow with film producer Abigail E. Disney, film director Gini Reticker, and Michelle Barsa, Lead Advocate and Afghanistan Program Specialist at the Institute for Inclusive Security, and moderated by Kathleen Kuehnast, director of USIP’s Gender and Peacebuilding Center. “Peace Unveiled” is the third episode of “WOMEN, WAR & PEACE,” a groundbreaking five-part PBS television series that explores women’s strategic role in conflict and peacebuilding. 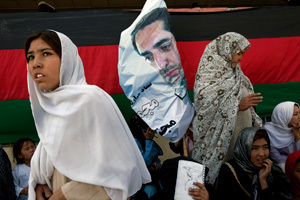 This documentary follows three Afghan women who have organized to protect women’s rights from being traded away in the reconciliation and reintegration process, as security operations begin to shift from ISAF to Afghan control. Entry filed under: Uncategorized. Tags: Abigail Disney, afghanistan, asia, Barbara Boxer, developing world, development, documentary, event, Fork Films, Gender and Peacebuilding Center, Gini Reticker, Helping Women Helps the World, Institute for Inclusive Security, ISAF, John Kerry, Kathleen Kuehnast, Michelle Barsa, PBS, Peace Unveiled, peacebuilding, Russ Carnahan, United States Institute of Peace, usip, Vital Voices, WAR & PEACE, women, women and war, women's rights.